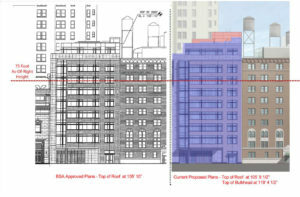 BSA should not give Congregation Shearith Israel (CSI) a free pass to build precedent-setting $60 million condominium(s). 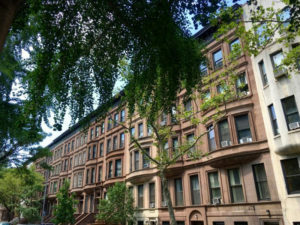 The desire for condos is driving the proposed construction of a new community house that, all told, will be twice the height of brownstones that define the West 70th Street midblock. BSA approved CSI’s so-called “hardship” application – over tremendous community opposition – in 2008 based, in significant part, on CSI’s alleged need for classrooms for a school that is no longer there. What is the “programmatic need” now? BSA should consider the fact that CSI spent nearly two years after BSA’s 2008 approval angling to construct a building that contained almost no classrooms. BSA should not approve changes to the building’s design that CSI claims are “minor” but in fact are far from minor, involving changes to the overall height, façade, interior layout, and mechanicals with potentially adverse impacts on adjacent properties. BSA should demand fresh environmental and economic analysis of the project. BSA should not bend its rules to excuse CSI’s failure to construct the 2008-approved building within reasonable time limits. CSI’s time to act has clearly passed. To sign the online petition to BSA and others, please click HERE. For more information and background on this issue, please click HERE.